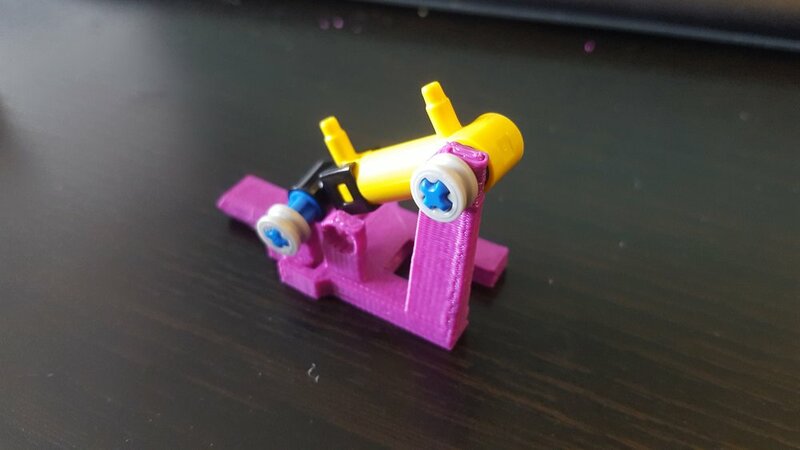 It's amazing how quickly one can iterate on a design with a 3D printer - I know I'm late to the party but I can see how they will change (and presumably have changed) prototyping and design. The finger joint attached to a back plate which is strapped to the back of the user's hand. 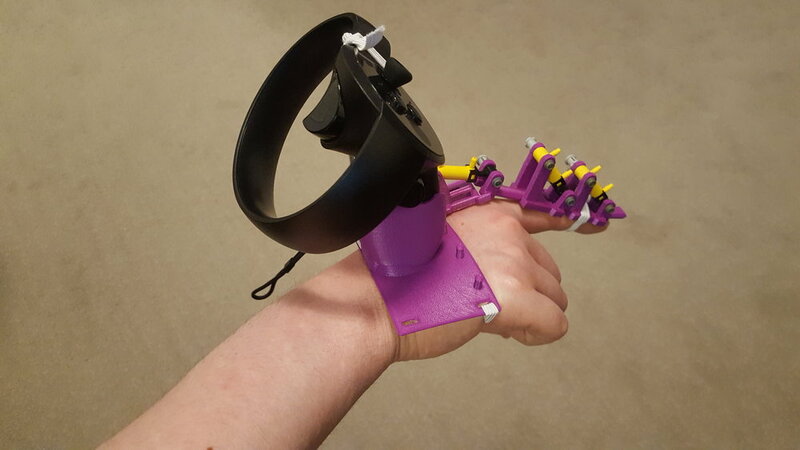 At this stage I'm mounting the VR controller to the back plate but for the final glove design I hope to include pistons with sensors attaching the glove to a forearm mounted unit housing the electronics and compressor. 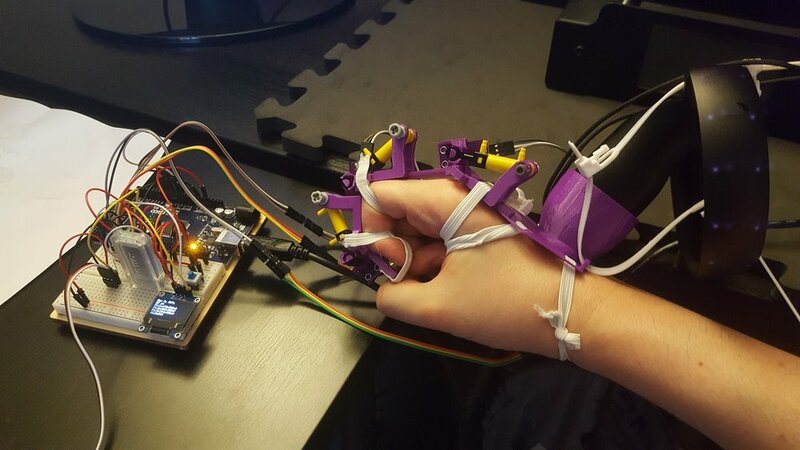 The wrist pistons will allow the glove to simulate force feedback similar to the kick back from a gun, and the sensors mean the VR controller can be mounted on the forearm (where its mass and inertia will be felt less) while still allowing the glove to report accurate hand and finger positions to the VR environment. 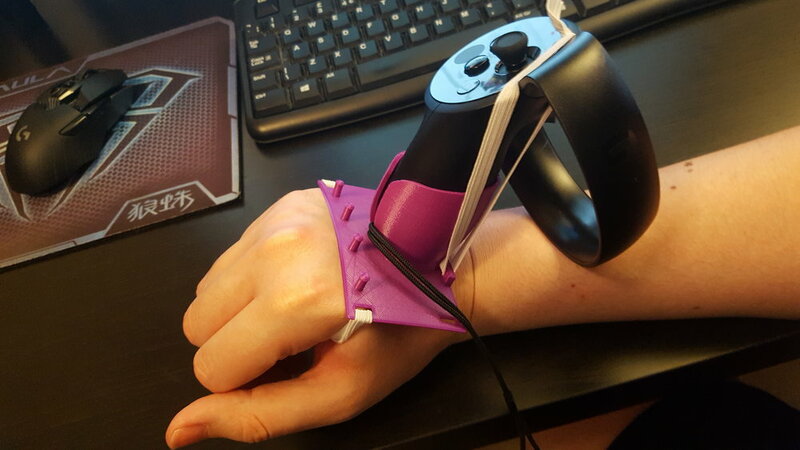 I'm also planning on creating separate quick-release mounts for the Oculus Touch and Vive Tracker - I'm just using the Touch for now as the Vive is set up in a separate room while the Touch is in my office. For the prototype I'm controlling the air flow with a servo based valve. This is likely to be slower than a solenoid based equivalent but has a few advantages. It requires less current so is easier and safer to work with, and only requires power when moving to a new position. Last up for now if the compressor. I tried a few designs based on a high RPM DC motor but none were satisfactory. You can make gear boxes with a 3D printer but it's difficult to make a good one, and even when it worked it was far too loud. I found these brilliant motors with a built in gear box which can take them down to 15RPM, though I found the 70RPM one to be the best balance between power and speed. 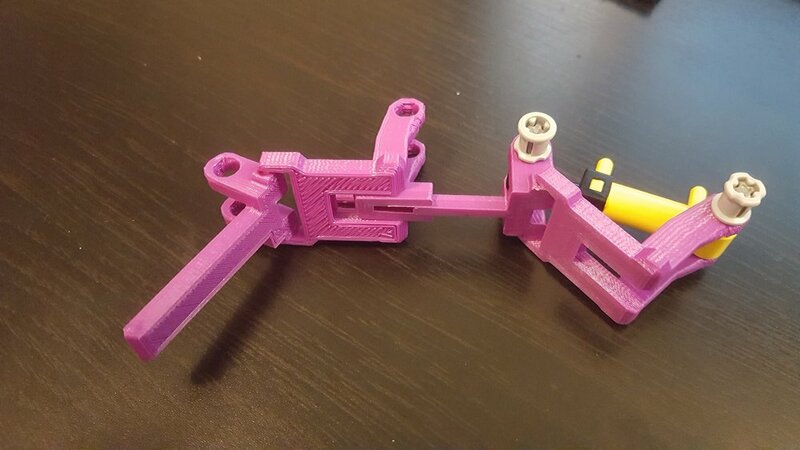 The compressor mount needs an adjustment due to it flexing too much, but that's lined up to be 3D printed soon. I've recently switched from working on Arduxim Squadron Command to looking again at the pneumatic VR glove concept. I originally worked on this two years ago so it's quite a gap. 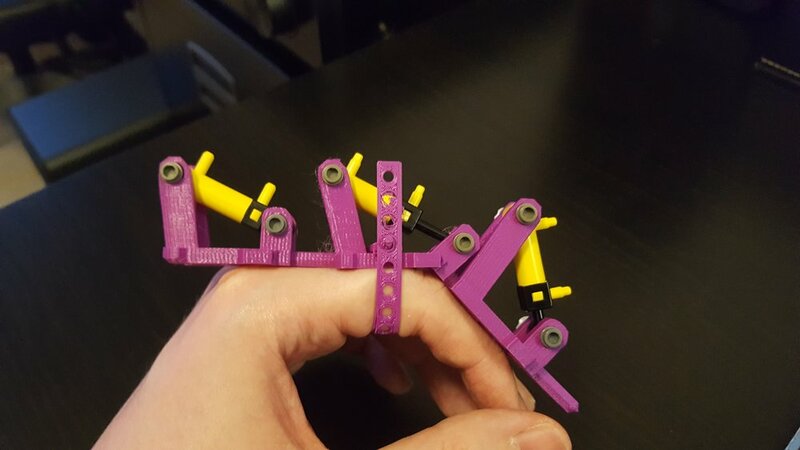 I wasn't able to continue then due to relying on Lego parts for the structure of the glove, but I've recently bought a 3D printer which has been hugely helpful. The printer is a Monoprice Maker Select Plus - a fairly low end printer at around £300 but it is doing the job brilliantly and has let me try multiple designs for components of the glove. At the moment I'm still using Lego Technic for the pneumatics but I hope to create 3D printed pistons and valves in future. 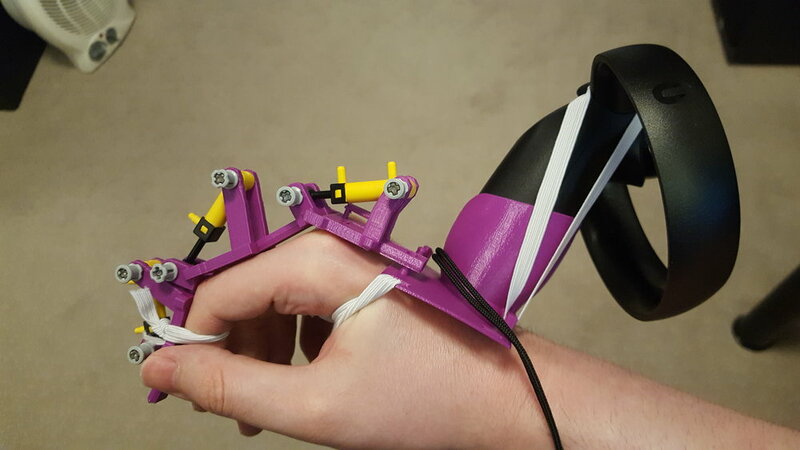 This is a challenge but I don't think the pneumatic parts need to have perfect seals (and the glove may even work better without that) so 3D printing them may be possible. Below are some of the designs. The first two images show the compressors I've tried - none have pumped well but each iteration gets better. The rest are the finger joints, in the last images with the piston attached for a manual test.